Backyard Late Summer Nighttime Sky Over New Jersey. Last night the sky was clear, and the waxing gibbous moon (61%) bright, so I set up a couple of cameras with big lenses out on the deck. One of the systems (Nikon D4 camera TC-E III 20 teleconverter and 600 mm f/4 VR lens (ISO 400, 1200 mm, f/8, 1/60 sec)) was set to record video (1080p, 30 fps). While reviewing the videos I noticed one with something (a bird?) passing in front of the moon. Played back at 10 fps shows the transit to occur over 25 frames. The bird is not very clear, or in focus relative to the moon. Someday, I want to catch a satellite transiting in front of the moon. DSLR video of the 30-June-2011 Montgomery Township Fireworks display. The Nikon D3s camera is limited to 5 minute HD (720P) video segments. I ended up with three 5 minute segments. I left the in-camera sound recording on to get the sound effects of the fireworks. I also got commentary about the fireworks from a family sitting in front of my tripod. At one point you can hear a train whistle. The other clicking sound is the shutter of my other cameras. I used Adobe Premiere Pro to combine the first and third segments, zoomed in a bit so the firework display takes up more of the image, and increased the volume. I also used Premiere Pro to add a title page to the video. Last night the sky was clear, and the waxing gibbous moon (61%) bright, so I set up a couple of cameras with big lenses out on the deck. One of the systems (Nikon D4 camera TC-E III 20 teleconverter and 600 mm f/4 VR lens (ISO 400, 1200 mm, f/8, 1/60 sec)) was set to record video (1080p, 30 fps). While reviewing the videos I noticed one with something (a bird?) passing in front of the moon. Played back at 10 fps shows the transit to occur over 25 frames. Backyard Autumn Night Sky Over New Jersey: Bird Captured Flying Past the Full Moon. I missed the Lunar Eclipse because I am on the east coast. The sky was clear and the moon was full, so I did take some images and DSLR videos with a Nikon D3s and 600 mm f/4 VR lens + TC-E III 20 teleconverter. The D3s is limited to a 5 minute 720p HR video, so I would keep going out and restarting the videos. It was cold, and I wasn’t going to stay out there. The amazing thing when I started viewing the videos, on the very first one saw that I captured a bird flying across the moon. The duration of the transit was about 0.1 second. 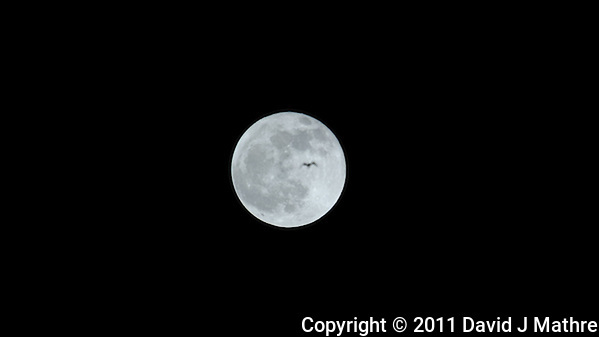 The frame-grab image from the video shows the bird in front of the moon. I think that it is a sea bird based on the wing shape, but hope that a bird expert can help with the identification. I’ve also included a video of the bird transit. The first pass is real time, the next six repeats are slowed down 10x. Backyard Summertime Nature in New Jersey. Bald Faced Hornet Hive Video. A year ago I recorded this DSLR video of the entrance to a Bald Faced Hornet Hive. It was recorded with a Nikon D3s camera and a Questar 3.5″ Birder Telescope. I needed the telescope so I could be at least 30 feet away from the basketball sized nest/hive. I understand that the bald faced hornet is easily upset, and unlike a honey bee is able to inflict multiple stings. Question regarding the video. Should it be shorter and only show when the hornets swarm out? Should I include background music and/or bee swarming sound effects? Is the title sequence too long? Leave a comment to let me know.